Happinet believes that maximizing corporate value and ensuring sound management are the most important issues facing management. To achieve these objectives, we have established a system to increase the transparency of management and to enable us to respond quickly and appropriately to changes in the business environment. In addition, we strive to actively disclose information to meet the expectations of shareholders and earn their trust. Moreover, we seek to build strong relationships with customers, employees, and society and consistently increase shareholder value over the long term. 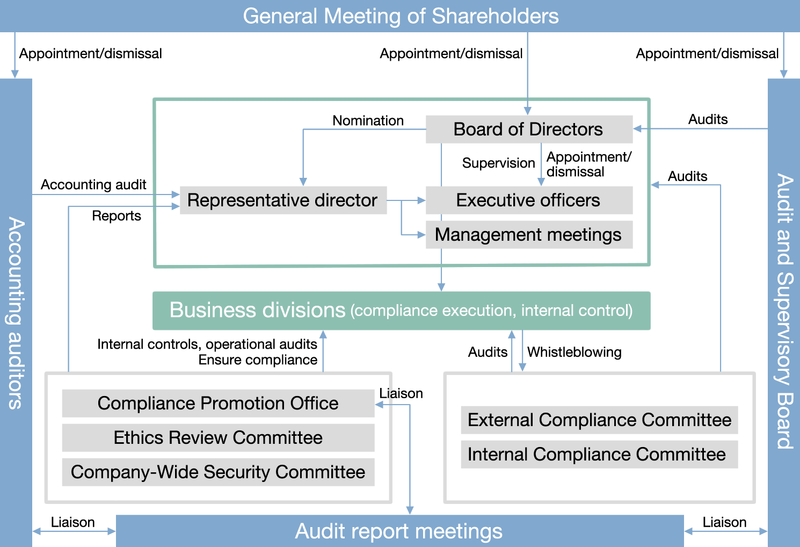 As shown in the diagram below, Happinet has built a corporate governance structure with the outstanding features outlined below. 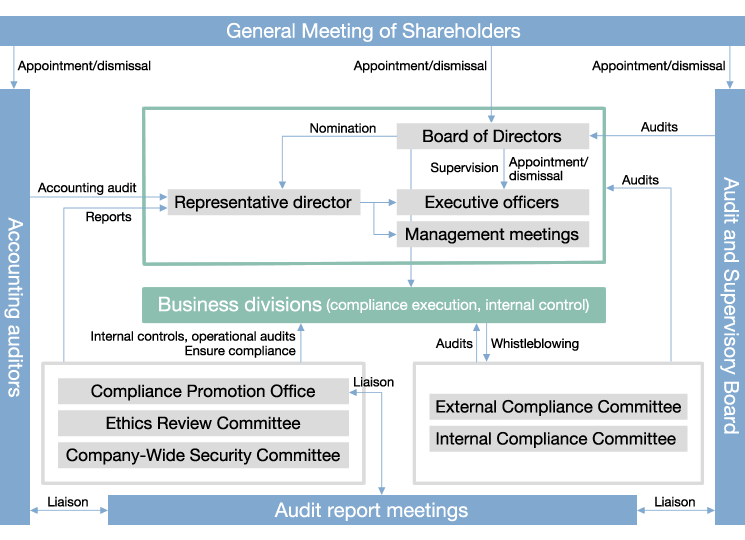 The pillars of Happinet's corporate governance are management policies set by the Board of Directors and decision-making functions performed by executives, along with audit functions based on the Audit and Supervisory Board system. In addition, we are working to strengthen the system of supervision by introducing an executive officer system and by separating management and execution. We are also working to improve the speed of management. We have adopted an Audit and Supervisory Board system based on the idea that it has the potential to further strengthen corporate governance, both by enhancing the operation of the executive officer system and by improving the system of outside directors and auditors. We have established an Executive Appointment Committee as a voluntary advisory committee in which outside directors participate. We have also set up a mechanism to obtain advice from legal counsel on an as-needed basis. In May 2006, the Happinet Group instituted a Basic Policy to Establish an Internal Control System to strengthen the internal control system. In April 2008, we became subject to the internal control reporting system stipulated under the Financial Instruments and Exchange Act in Japan. Since then, we have moved forward with measures such as evaluating the effectiveness of our business processes and documenting our verification methods. In addition, we are pursuing similar measures to be implemented in companies that have recently joined the Happinet Group. In fiscal 2013, the Compliance Promotion Office conducted evaluations of the development and operation of internal controls. No problems were found or reported.